Blending style with performance and portability, the Acer Aspire 3935-744G25n is a great laptop that will appeal to a broad array of users seeking functionality on the go. The keyboard won't suit all users, but otherwise this is a fantastically well rounded machine. Despite weighing only 1.9kg - placing it in ultraportable territory - this laptop boasts powerful components which offer great performance. The Intel Core 2 Duo processor and 4096MB of DDR3 memory produces impressive test results, so concurrently running multiple office programs at speed won't prove an issue. An integrated GPU is in place, so apart from light photo-editing, this laptop isn't suited to multimedia tasks. To watch DVDs you'll need to purchase an external optical drive, as a built-in drive is not included. Portability is great and you'll easily get a very handy five hours from the battery, meaning you can leave the charger at home or in the office when you are out and about. The laptop is also very compact, making it easy to slip into a bag. Build quality is excellent and the metal chassis provides good protection for the machine and also looks great. The keyboard, using Acer's FineTip design with keys that stand up independently from the board, will not suit all users, as it's quite easy to get lost on the very flat keys. There's also a sizeable gap between the keys and the board beneath, which may gather dirt over time and hinder the action. The touchpad is responsive and features multi-gesture capabilities and also a fingerprint reader between the mouse buttons. This will suit those looking for an extra level of protection for their data. The screen features an edge-to-edge design, which makes a striking impression. It's also detailed and produces vivid colours. Thanks to the LED technology employed, it's also very bright and is less resource-intensive on the battery, providing the excellent portability mentioned above. A shiny Super-TFT screen coating is in place, but we found that reflections are well contained. Connectivity is suitably high-end, with 802.11n Wi-Fi and Gigabit Ethernet providing the fastest wireless and fixed network access currently available. There are also three USB ports for attaching peripherals, such as an external mouse. A VGA port for hooking up external analogue monitors is included, but the omission of an HDMI port seems an oversight. 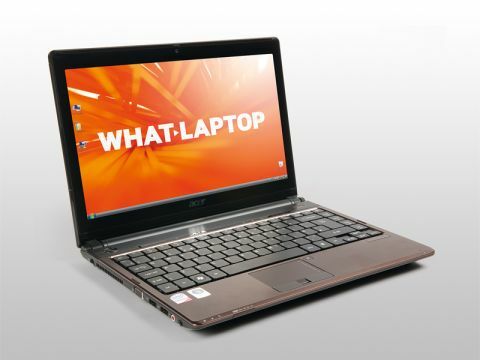 We're very impressed by the Acer Aspire 3935-744G25n. Its great performance is coupled with style and usability, and those after a well-priced ultraportable should take note.